This machine is a biometric device that scans eyes. This machine is also a mask that hides the backside of its violent logistics and algorithms designed around its screens. In both prints, the eyes are replaced by two images: The pattern of a fingerprint, the pattern of a scanned Iris, both behind the scanner, both organised as encoded bodies. The images are operative, programable in the sense that they function as a deterritorialized factory to generate profit. More precisely, your face and your eye have become nodes in a global network, worksites of informatic labor. 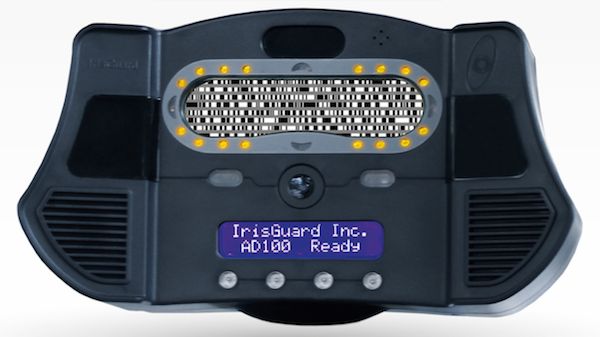 Iris Guard cooperates with the UN Refugee Agency. It delivers the algorithm, the interface and the hardware to perform iris recognition in refugee camps. Since 2013, all people arriving in the Jordan Zataari or Azraq camp must register their irises. With the new digital (and perfectly neoliberal) strategy of the UN to implement biometric registration in their camps worldwide, they have installed around 300 registration sites worldwide and scanned more than2,4 million refugees in their Public-Private-Partnership with Iris Guard. Produced in an automated way, the barcode is uploaded to a cloud server. 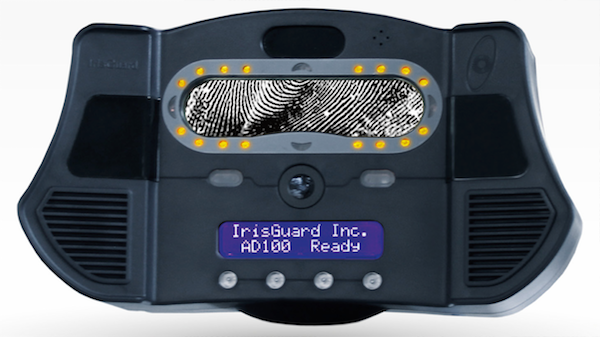 From that moment, the refugee’s identity can be automatically recognised, from any location in the world that houses one of Iris Guards machines. Even remotely, at a checkpoint or an airport for instance, and often without the individuals knowledge. The UNHCR’s database can potentially track, tag, monitor and predict not only their consumer behaviour but also their movement.The mode of data mining is compulsory since receiving food and relief aid is in large parts distributed through cash-based assistance: their scanned irises now replace cash or bankcards. The barcode is an operative image, making sense only to machines. The stored information behind its object recognition taxonomy is inaccessible to the individuals. The humanitarian rationale of urgency, something must be done, allows UNHCR to conduct political, medical and policing tests. The way it organises and commercialises its camps, illustrates how it manages the undesirables. Historically, new technologies and experiments were always tested and carried out on minorities or on groups perceivedas inferior. Camps serve as political-juridical grey areas, characterised by extraterritoriality, regimes of exception and marginalisation (Michel Agier). Continuities and connections between the politics of biometrics today and colonial pseudo-scientific methods of measurement such as Galton’s fingerprints or the Fowler family’s phrenology become visible as (colonial) measurements genealogies imbedded in “the racial calculus and the political arithmetic that were entrenched centuries ago” (Saidiya Hartman). The PhD project show how this colonial and imperialist episteme that invented human races to legitimise slavery and exploitationstill shapes biopolitical discourses today, even though under changed signs of efficiency, innovation and the logic of ever expanding markets. This research proposes to investigate how refugees of the global peripheries become experimental, precarious populations in huge Labcamps in which statistic, algorithmic and biometric technologies choreograph their performance. The precariousness of living in the camp, the control via algorithmic governance, the exploitation of refugees in the Labcamp as objects of experimentation and as producers of informatic turn the camp into a site of production, application and absorption of globalised computational capital (Jonathan Beller). On all these levels a new form of work is in progress, a work that generates surplus value from scarce resources. The case of the Rohingya refugees enrolment in Bangladesh is but one example of the perils UNHCR’s Biometric Identity Management System imposes on vulnerable populations. See: Zara Rahman, https://www.irinnews.org/opinion/2017/10/23/irresponsible-data-risks-registering-rohingya, IRIN NEWS, 15.12. 2017. Michel Agier, Managing the Undesirables. Refugee Camps and Humanitarian Government,Cambridge University Press, 2011. Saidiya Hartman, Lose Your Mother.A Journey Along the Atlantic Slave Route, Farrar Straus & Giroux, 2008, Prolouge: The Path of Strangers. Jonathan Beller, The Message Is Murder:Substrates of Computational Capital,Pluto Press, 2018.